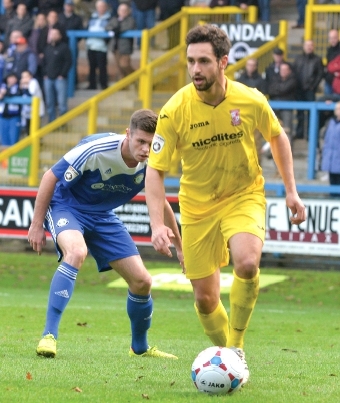 WOKING shook things up at the Shay with a 3-1 win over promotion rivals FC Halifax Town. Sunday’s win finished off a dream weekend for boss Garry Hill, who saw his side slingshot up to third in the Vanarama Conference table with their 10th win of a storming start to the season. Indeed Cards – and this Saturday’s visitors Barnet – were the only two top-half sides to manage maximum points from the latest round of league fixtures. “It’s a very satisfying weekend,” said a thrilled Hill, with Cards now just 10 points off front-runners Barnet – although crucially, the Cards hold the ace of two games in hand over the Martin Allen’s Bees, who visit Kingfield this weekend, in what promises to be a mouthwatering clash. A total of 52 plucky travelling Cards fans made the Sunday trek up to Yorkshire, while many more opted to catch the action back on the big screen at Kingfield and across the country with the game being broadcast live on BT Sport. Last season Cards reserved their best performances for the big away games, including a memorable 4-3 win on their last visit up to Halifax, plus the unforgettable 1-0 win over champions-in-waiting Luton Town at Kenilworth Road the last time the BT cameras were rolling back in March. Having snuffed out the Dragons’ flames during their 1-1 return match-up back at Kingfield in midweek, however, Hill admitted that he had seen enough of a reaction from his players to suggest a repeat of last season’s watershed win at the Shay was on the cards. “They only lost one game here last season; we beat them, and we’ve come here and done it again today,” beamed a proud Hill on the touchline post-game. Hat-trick hero that day Jack Marriott was ruled out this time around through illness, which meant a rare start for set-piece starlet Giuseppe Sole. And it was new goal centurion Sole who justified his manager’s decision by opening the scoring midway through the first-half with yet another bewitching bit of dead ball sorcery – akin to his strike at Aldershot back in September. Neil Aspin’s Town sat level with Woking on 32 points but one rung lower in the promotion ladder in eighth place on goal difference before kick-off. While the Shaymen haven’t exactly been moving any mountains with their stuttering form of late – they lost a crunch clash with second-placed Grimsby in midweek – last season’s play-off semi-finalists have a reputation for being one of the more physically imposing sides in the division. But it was their upwardly mobile visitors who imposed themselves on this game from the first whistle, with Scott Rendell linking up to create two early one-on-one chances for Sole, although Town keeper Matt Glennon stood firm. But Sole’s eye now in, the Shay stopper could merely marvel at the striker’s swerving long-range opener which nestled in the Glennon’s top right-hand corner from all of 40 yards out. Pushed into a more advanced role by Hill for this game, Adam Newton then doubled his gaffer’s delight with just his third Woking goal on the stroke of half time; surprise scorer Newton stealing in unmarked at the back stick to steer home a low Rendell centre from the left. Sole even found time to clip Glennon’s bar with one more sumptuous chip before the break. Halifax looked to stem the yellow tide in the second period but some courageous Joe McNerney and Theo Lewis blocks kept them in check. Newton then deposited another to double his own personal Woking goal account on the hour mark, the full-back steering home the kind of cultured left-foot finish his forwards would be proud of. Town did pull a goal back through a Paul Marshall penalty with 20 minutes remaining – with James Clarke tangling with sub Jamie Jackson – but Woking held firm to set themselves up for that table-topping clash with Barnet on Saturday in style. “That was lovely. That was a very special win,” was Hill’s satisfied reaction. WOKING: Cole, Newton, McNerney, Clarke, Cestor, Betsy, Payne, Lewis, Arthur, Sole (Goddard, 77mins), Rendell.